PANAMA CITY (AP) — The June meeting was conducted behind closed doors far from the klieg-light attention normally focused on Venezuela. Around a U-shaped table in a hotel towering above the Panama Canal, U.S. Treasury Department officials distributed a list of suspected shell companies that they believe senior Venezuelan officials have used across the globe to siphon off millions of dollars from food import contracts amid widespread starvation in the oil-rich nation. The two-day meeting, and several others that have taken place since April, are part of a sustained campaign by the Trump administration to pressure President Nicolas Maduro by striking at the wallets of the top officials in his socialist administration. “They know we’re after them, and they know we’re after them on a multinational basis because we’re beginning to see the networks morph and new shell companies stand up and existing ones wound down,” Marshall Billingslea, the assistant Treasury secretary for terrorist financing, said in an interview on the sidelines of the meeting. At that gathering, financial forensic investigators from the U.S. and three conservative Latin American allies — Mexico, Panama and Colombia — traced transactions by companies believed to be controlled by a government-connected businessman, according to several participants who spoke to The Associated Press on the condition of anonymity because the deliberations were private. Since Donald Trump became president, dozens of senior Venezuelan officials, including Maduro himself, have been sanctioned by the Treasury Department over allegations of corruption, human rights abuses and drug trafficking. Last year, Trump even threatened a “military option” to remove Maduro and, with senior aides and Latin American leaders, raised the possibility of invading the South American country. As the country’s economic troubles mount, he has sought to rally regional pressure as well. The focus on food is deliberate, said Billingslea, a key driver of U.S. policy toward Venezuela who led Trump’s national security transition team. A story published by the AP in 2016 revealed how senior Venezuelan officials and members of the military were enriching themselves by diverting money from food contracts. 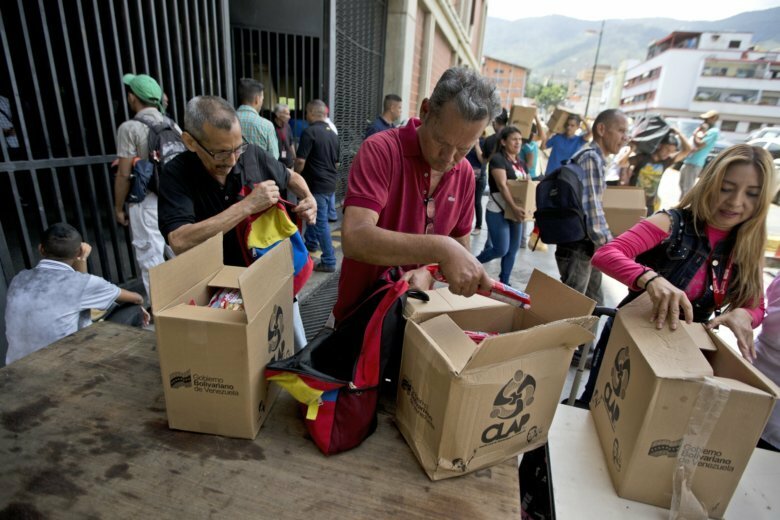 Since then, as hunger has spread, Maduro has moved to assert even greater control over food distribution, handing out monthly boxes of staples that critics label a form of dictatorial social control. Maduro said he began distributing the so-called CLAP boxes — a Spanish acronym for Local Committees for Supply and Production — as a way to circumvent the “economic war” being waged by the U.S. and opponents seeking to oust him from power. As Venezuela has fallen deeper into political and economic turmoil, the CLAP program has become a tenuous lifeline for millions of citizens suffering due to barren supermarket shelves and hyperinflation estimated by the International Monetary Fund to soon reach 1 million percent. Critics say Maduro has essentially weaponized food, distributing the boxes primarily to government workers and supporters. According to an April survey by the local pollster Datanalisis, more than 60 percent of Venezuelan households said they received CLAP box in the previous three months — about the same percentage that helped re-elect the embattled leader in May presidential elections boycotted by the opposition. The allegations are fueling calls from Latin American leaders, including the heads of Argentina, Colombia and Chile, for Maduro to be tried in an international court for crimes against humanity. On a recent weeknight, word quickly spread among employees of a government-supported cultural center about the downtown Caracas location where they could collect their monthly CLAP ration. Within a few hours, everyone from museum curators to janitors waited in line to sign a clipboard before government loyalists slid a box across the table. Once outside, some workers tore open the boxes, transferring the contents — cooking oil, flour, rice, canned tuna — to backpacks for fear of becoming walking targets in one of Latin America’s most violent cities. Some said they planned to resell the food on the black market, where a single bag of sugar can easily fetch more than 100 times the heavily subsidized price of the entire CLAP box. Among those under scrutiny by the coalition of countries is an obscure Colombian businessman who struck gold selling to Maduro’s government. Alex Saab, from the Caribbean city of Barranquilla, was a major focus of the closed-door meetings in Panama City, the participants who spoke on condition of anonymity told the AP. At one point they even studied the movements of a U.S.-registered private jet to identify his current whereabouts: Caracas, Paris, or Lebanon. Saab gained some prominence in 2011 after signing an agreement to build social housing for the Venezuelan government on behalf of a Colombia-based construction company. He appeared on Venezuelan state television alongside Maduro, the late President Hugo Chavez and then-Colombian President Juan Manuel Santos. Investigators say Saab entered the food business through a Hong Kong-based company, Group Grand Ltd., which they say bears the hallmarks of a shell company, including no known track record in the food business, a rudimentary webpage that is now inaccessible and an address in Caracas shared with Saab’s construction company. Group Grand has been awarded contracts to provide at least 11.5 million CLAP boxes, according to a Venezuelan Food Ministry spreadsheet obtained by the AP. Billingslea would not discuss specific individuals or entities on the task force’s radar, but said going after what he believes is money stolen from food imports by Maduro and first lady Cilia Flores is a top priority. Prosecutors in both Miami and Colombia have been investigating Saab for more than a year, four U.S. and Colombian officials with knowledge of those investigations told the AP. All spoke on the condition of anonymity because of the sensitive political nature of the ongoing probe. Saab’s Miami-based lawyer, Richard Diaz, rejected allegations of any wrongdoing, saying that Saab has been subjected to undue scrutiny and harsh media coverage because of false testimony leveled against him. He said that if the U.S. had cause to believe the allegations were possibly true, his client would have been charged long ago. Saab said in a statement that he is being targeted by government opponents looking to sabotage the economy. “Instead, they should be thankful that despite so much bad press and international blockade there are still businessmen willing to invest and believe in the country,” he said. The U.S. Treasury estimates that at least 70 percent of the CLAP program is being gutted by corruption, citing evidence of overbilling. Among the transactions that have raised red flags is a September 2017 invoice presented to Venezuela’s food ministry by Group Grand for $41 million worth of powdered milk at a price of $6,950 per metric ton, or more than double the market price at the time. A copy of the invoice was provided to the AP. “Never have we seen prices that high, not even in times of crisis,” said Roger Figueroa, president of the Venezuelan dairy industry’s lobby group. A study conducted by Figueroa’s group also found that the powdered milk distributed in the CLAP boxes regularly contained a third of government-mandated protein levels and twice the level of recommended carbohydrates. The investigative cooperation between the U.S. and other countries began about a year ago at the urging of Trump officials, and already has yielded some results. On May 17, three days before Maduro was re-elected, then-Colombian President Santos, acting on information provided by the U.S., announced the seizure of 15 shipping containers filled with more than 25,000 CLAP boxes stamped with Chavez’s image and containing beetle-infested rice and other spoiled food. In testimony to police obtained by the AP, the owner of a Colombian company said he was hired by another firm to assemble and ship the boxes to Venezuela’s Corporation of Foreign Trade, or Corpovex, which had for years been under the stewardship of an air force general. A U.S. Treasury advisory last year warned American banks about the risks of doing business with Venezuelan clients, citing Corpovex as a vehicle frequently used by corrupt officials for embezzling state funds through shell companies. The seized CLAP shipment, which was valued at over $500,000, was never sent. It spoiled sitting on the docks because the firm that ordered it, a Portuguese company called Agrovarius, said its bank accounts had been frozen and it could not pay its bills, according to the police testimony. Little is known about Agrovarius, which is located behind a high white wall in a Lisbon suburb. One of the company’s listed owners, Joao Rosa, denied having anything to do with the Colombian shipment and insisted all the company’s vendors had been paid. Agrovarius also was implicated in what has come to be called the so-called pork revolution, which took place last Christmas when angry Venezuelans took to the streets when Maduro failed to deliver on a promise to provide thousands of free hams to poor neighborhoods. Maduro accused Portugal’s government of “sabotaging” the holiday gift, but the long-established Portuguese meatpacker Raporal pinned the blame on Agrovarius, saying it was never paid the more than 6 million euros needed to supply Venezuela’s government with the meat. A spokesman for Raporal said the company is now suing Agrovarius for breach of contract. Rosa said Agrovarius had nothing to do with the botched Christmas ham shipment. Billingslea, meanwhile, said that Maduro has repeatedly sought to deflect blame for his own mismanagement and refusal to address mounting hunger. “If they really wanted to feed people, they’d let in the foreign aid that’s been offered,” he said. Associated Press Writers Scott Smith in Caracas, Venezuela, and Barry Hatton in Lisbon, Portugal, contributed to this report.